Have you ever had that sinking feeling of disappointment, when you buy a new camera and then realise Lightroom won’t support it? I recall once buying a Sony NEX5 almost as soon as it launched. I was so excited to find out how good the image quality was, but then when I tried to open the files in Lightroom I was greeted with the message that the file wasn’t supported. It was in fact a number of painful months before Adobe launched the support for the NEX5 during which time I needed to shoot in both RAW format and JPEG so at least I could enjoy the images. 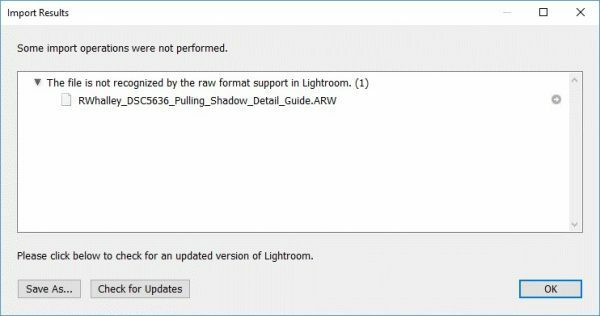 If you find yourself faced with this problem and screaming “Lightroom doesn’t support my camera”, this article shares a few solutions you can try. The reason this problem arises is that camera manufacturers tend to change the format of their RAW files each time they release a new camera or model. This means that RAW converters such as Lightroom or Photoshop need to be updated to be able to read the format. Actually, this is not entirely true as some converters will read new formats as soon as they are released. Two examples that you might find work with new RAW files are Photo Ninja and RAW Therapy (free). These may not support all the features of the new RAW file but it may be enough to give you a short time solution whilst you wait for the RAW file to be supported. Have you tried updating your RAW support? Sometimes the problem is as simple as you not having downloaded the latest update for your RAW converter. 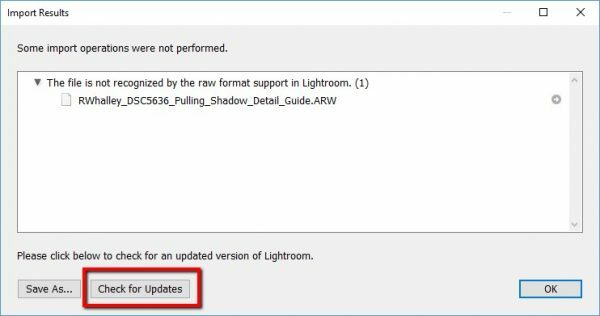 In Lightroom you will find the option to check for updates. Assuming you do have the latest updates, try the Adobe website to see if a release is scheduled. At least you will have an idea of when RAW support will become available. It also doesn’t hurt to leave a support request either. So far we have assumed the problem is that your camera is new and that the RAW file support hasn’t been released. But another, possibly more common scenario can also exist. You might find you are using an earlier version of Lightroom, one that was released before your camera came onto the market. An example of this might be that you have Lightroom 4 and are shooting using a Sony A7. This camera was released after Adobe released a replacement for Lightroom 4. To understand what is happening here you need to understand the Adobe software model. Ideally Adobe would like you on their SaaS licensing model. SaaS stands for “Software as a Service” where you effectively rent the use of the software from Adobe. If you stop paying the rental the software eventually stops working. This is good for Adobe as it makes their revenue stream smoother and more predictable. It’s also good for the consumer as you get the latest version of the software with regular updates and enhancements. This is the model Adobe refer to as the Creative Cloud. But not everyone can afford or wants to rent their software. Some people like to pay for a version and then want to continue to use that software for as long as possible. I know a lot of people who like Lightroom 4 and don’t want or need to upgrade. The model Adobe follow for their version based software is to have a major release where the version of Lightroom increases for example version 3 to 4 or 4 to 5 etc. During the life of every major release there are a number of minor releases for example 4.1 to 4.2 to 4.3 etc. When these minor releases are made, the RAW conversion is also updated, which is when RAW file support is released. Once a major version of the software is released, the RAW file support is closed off. This means that no new RAW support is released and you must upgrade to the new version of the software if you want support for new cameras. This feels a lot to me like built in obsolesce, although I’m sure there is a good technical reason for this. If you find yourself in this position, there is a free solution although it takes a little bit of extra work. This solution is the Adobe DNG Converter. Some time back Adobe launched the DNG file format and made it open source. Being open source meant that camera manufacturers were free to adopt it, building it into their cameras rather than proprietary RAW formats. The bonus for Adobe would be less need for RAW updates and lower software maintenance costs. Adobe also built support for the DNG format into their image editors so you will find this in Lightroom and Photoshop, probably going back 10 years or more. Now here’s the nice thing about the DNG format, it is backwardly compatible. You can create a DNG file today using the latest DNG converter and you will still be able to open the file with the likes of Lightroom 4. There are also regular releases of the DNG Converter so as Adobe releases RAW support for new cameras, the DNG Converter is also updated. In short, you will be able to convert a RAW file from the latest cameras into the DNG format and then open and edit the DNG file in much earlier software. You also get all the image quality of a RAW format file. 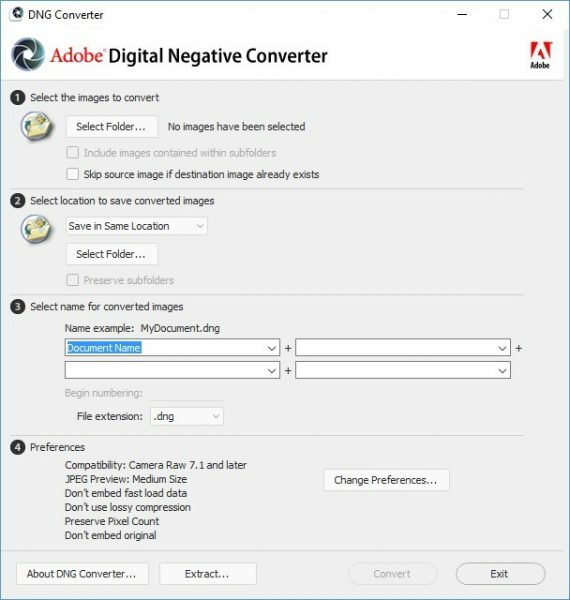 If you need to find the latest DNG Converter take a look on the Adobe website using this link for Windows. And the following link for Mac. Hopefully some of the advice in this article will help you and you won’t ever find yourself complaining “Lightroom doesn’t support my camera”.